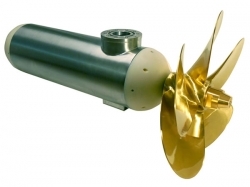 Manufacturer of electrical generators and electric drive systems for recreational and commercial vehicles and yachts, Fischer Panda will unveil its new 100kW AZ podded motor for its 420V drive systems, designed for commercial boat operators, in particular water taxis and smaller ferries with a displacement of more than 40 metric tons. The highly efficient permanent magnet motor is brushless and sensorless. The full 800Nm torque is available throughout the entire speed range; even at lower speeds, the electric motor provides vessels with a powerful and responsive motor for maneuvering in and out of harbor. The motor operation is very quiet, requires no gearbox, and is fitted in a robust, water-cooled, stainless steel housing. Three lip seals fitted on the seawater side make it suitable for commercial applications. The winding is further enclosed in a casting component.